Scientology, Belgium, Raided by Cops the day before protests!!! If you find any protest news media links then please post them to this thread. There will be a protest thread in the Opinions & Debate forum for all the photo and youtube links for you to post as you find them here..
Last edited by Sponge on Mon Apr 14, 2008 2:55 pm, edited 4 times in total. This anon did great. Very well spoken. More of an article on Rick Rolling but the April 12 London protest gets a mention in the The Times. .......In London yesterday protesters from a group called Anonymous used his song in more demonstrations against Scientology. “We might use it in other things as well,” said one of the group who declined to be named. What sort of things? “We haven’t thought of them yet.” This craze could yet go further. While Astley has agreed to appear among fellow ageing chart-toppers in a short “Eighties tour” across Japan and in Britain next month, there is hope for him that his internet fame will wane. Protesters arrive by bus to join an anti-Scientology demonstration outside the Church of Scientology in London. They came, they shouted, they handed out cake. And then they played Rick Astley's Eighties hit 'Never Gonna Give You Up'. More than 300 members of the secret internet-based organisation Anonymous, which campaigns against the Church of Scientology, protested outside the latter's headquarters in the City of London yesterday. The maverick, at times surreal, protest saw the group's members, who wore masks like the one worn by the main character in the cult film V for Vendetta, hold up placards attacking the controversial sect, whose supporters include Tom Cruise and John Travolta. Anonymous alleges the church is a profit-obsessed organisation that practises a policy of 'disconnection' by seeking to prevent its members from communicating with friends and family. The claims are denied. "Pet lovers and Scientology critics converge on Clearwater"
Members of the group Anonymous line Cleveland Street in Clearwater on Saturday in a protest of the Church of Scientology. CLEARWATER — Clearwater's petite downtown district was primed for the perfect storm on Saturday. On one end of downtown, 135 masked members of the group Anonymous began gathering at about 10 a.m. to protest the Church of Scientology. Just a few blocks away, animal lovers brought their dogs for Clearwater's annual pet fair, which was unrelated to the church. The dark-suited, boisterous protestors might have disrupted the owner-pet look-a-like contest and other festivities, but the two groups stayed apart. And Saturday's daylong protest — about half the size of the two preceding ones — ended with no arrests. Anonymous, a loosely organized group that formed on the Internet, used the demonstration to target what it calls the church's "cruel and inhumane" policy. The group says that Scientology requires church members to disconnect from friends and relatives who have left the fold. The group rented out the Royalty Theatre downtown and two former Scientologists — Mike Henderson and Creed Pearson — spoke about the pain they suffered from not being allowed to contact relatives still in the church. "I can't speak to my brother or my four sisters," Henderson said in a tearful speech. "I have attempted to speak to my son and my daughter and my mother, to no avail." After the presentation, Anonymous members, whom the church has likened to terrorists and Ku Klux Klansmen, retired to Coachman Park for pizza and cake. The group made three circuits of downtown, shouting slogans and drawing honks from passing cars. Scientologists sitting in front of Starbucks said they didn't care for the protesters. "It's a group that just spews hate. Who has time for it?" said Dwight Matheny. "They're like the barking dog at the wheels of a fire engine going to a fire," said Bob Johnson, 56, a Scientologist visiting from California. Church spokeswoman Pat Harney said Henderson and Pearson, not the church, are to blame for their broken family relationships. "If they want to take responsibility for past wrongs and repair their relations with their families," she said, "the church would be more than happy to help." The protest wrapped up just before 5 p.m. The group plans to return to Clearwater next month. Jonathan Abel can be reached at jabel@sptimes.com or (727) 445-4157. No, we spew cake when we've eaten too much. It's so delicious, it's hard to resist. WTF? You on drugs Bob? Hell, that would look good on a protest sign. Can we quote you on that Bob? Care to draw us a picture? "Masked protesters rally against Scientology"
'disconnect', in Winnipeg on Saturday, April 12, 2008. Church of Scientology in Winnipeg on Saturday, April 12, 2008. The group was demonstrating today against what they call Scientology's policy of "disconnect" -- in which the friends and family who criticize the religion are allegedly shut out of a member's life. "They split up families. It results in children losing their parents, husbands losing their wives," a masked protestor said in Winnipeg. "If these people are creeping you out and you think they're some sort of cult that are going to target you individually for protesting their cause, are they really that powerful?" one Winnipeg cop asked the protestors. "I think it's a privilege to be a Scientologist and it's something you have to earn," Cruise says in the video, as part of the Mission: Impossible theme plays in the background. "A group of masked activists hit the streets to protest scientology on Saturday"
5 nice photos from Reuters via Yahoo News..
Two protestors sit on a bench during an anti-Scientology demonstration outside the Church of Scientology in London April 12, 2008. The group, calling itself 'Anonymous', called for a day of world-wide picketing of the Church. Protesters wave during a demonstration outside the Dianetics and Scientology Life Improvement Centre in London April 12, 2008. The group, calling itself "Anonymous", called for a day of worldwide picketing of the Church of Scientology. Protesters arrive by bus to join an anti-Scientology demonstration outside the Church of Scientology in London April 12, 2008. The group, calling itself "Anonymous", called for a day of worldwide picketing of the Church. WINNIPEG — Demonstrations were held in several cities across Canada and around the world against the Church of Scientology Saturday. The rallies were organized by a group calling itself Anonymous, a loose coalition of protesters who wore masks to hide their identity to prevent what they fear is retaliation by Scientology hardliners. In Winnipeg, one masked protester who didn't want to give his name said Scientology controls its members and harasses its critics. Rallies against Scientology were also held in Toronto and Halifax, as well as London and Sydney, Australia. Actors Tom Cruise and John Travolta are among the high-profile members of Scientology, which was created in the 1950s by American writer L. Ron Hubbard. Demonstrators surround the Church of Scientology headquarters in Boston yesterday. A group that calls itself “Anonymous” and is dedicated to opposing the Church of Scientology demonstrated in Boston yesterday as part of what it said was a worldwide protest against the church. Roughly 150 Anonymous members, many wearing Guy Fawkes masks, costumes and otherwise shielding their identities, gathered at the intersection of Beacon and Hereford streets, where the Boston church headquarters is located. Fawkes was involved in a 1605 plot in England to blow up King James I and the Parliament. The costumed protesters held signs urging passers-by to educate themselves about Scientology and what the demonstrators said were the church’s abusive practices. They protested Scientology’s “disconnection” policy, which the Anonymous group said separates church members from family and friends who are nonbelievers. Members say Anonymous has grown from a small band of Internet hackers and pranksters into an international organization, with no leader and no names. Members said it was the group’s third international protest. A previous protest brought out 10,000 demonstrators in 100 cities, they said. Scientology has addressed Anonymous’ claims on a Web site, Anonymous-exposed.org. The site says “the church has not interacted with these ‘Anonymous’ individuals nor does it desire to,” which was evidenced yesterday by a police detail in front of the church. “The kids in the neighborhood are frightened. That’s why I hired some police,” said the church’s Rev. Gerard Renna. Church member Kevin Hall said anti-Scientology demonstrations are always a concern. “When you’re throwing hate out there, some crazy’s going to do something,” he said. 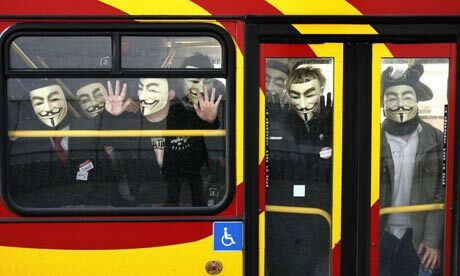 What do you think of Anonymous, the group that protests against Scientology? 69% - They have a right to protest and believe in their cause. 2% - It’s kind of creepy to see people in masks protesting a religion. 24% - I don’t consider Scientology a religion so the protests don’t bother me. Last edited by Sponge on Mon Apr 14, 2008 8:53 am, edited 1 time in total. BILOXI (WLOX) -- They wore masks, bandanas, even t-shirts to hide their identities. Some of those who protested outside Biloxi's Church of Scientology Sunday say they prefer to remain anonymous to avoid any potential problems with the church. They're calling this protest mission, "Operation Re-connect," a direct response to a scientology term called disconnection. "If you're a scientologist and you have family members who are critics of scientology or don't agree with scientology, the church will ask you to disconnect from your family members who are not scientologists," said an anonymous protestor. The Church of Scientology's International website addresses the issue. However, it's version of disconnection focuses on the person's right to choose whether or not to distance him or herself. Another problem protestors say they see is the idea of the church requiring people to pay to advance their way into the church. "In scientology, certain courses and books cost a flat fee, and you have to pay that fee to advance in the church and be apart of the religion. It seems more like an elite club where you have to be pay to be a member," said an anonymous protestor. The director for the Mission of the Gulf Coast Church of Scientology, Michael Quint, admits people do buy materials as they advance in the faith. However, he says some of the religion's core instructional books can be found in libraries for free. While the protestors who gathered may not see eye to eye with scientologists, they say they do not oppose a person's right to choose what he or she wants to believe. "The choice is up to anybody. I won't begrudge someone for being a follower of scientology," said an anonymous protestor. Michael Quint, says he has no problem talking with the protestors as long as they take off their masks. Quint says, he's nervous about people hiding their identities because recently, scientology churches have gotten numerous threats from anonymous groups. The protestors say they plan to organize another protest next month. The official Clambake London video from our Vled. what stands out most to me however is the very childlike way she talks. first she calles disconnection a fable, then she argues thatthere have been investigations by 'religious experts' into this wich cleared them. i saw similar stuff on one of their dutch anti drug sites. its of a such a childlike nature that a 6yo might be insulted by it.